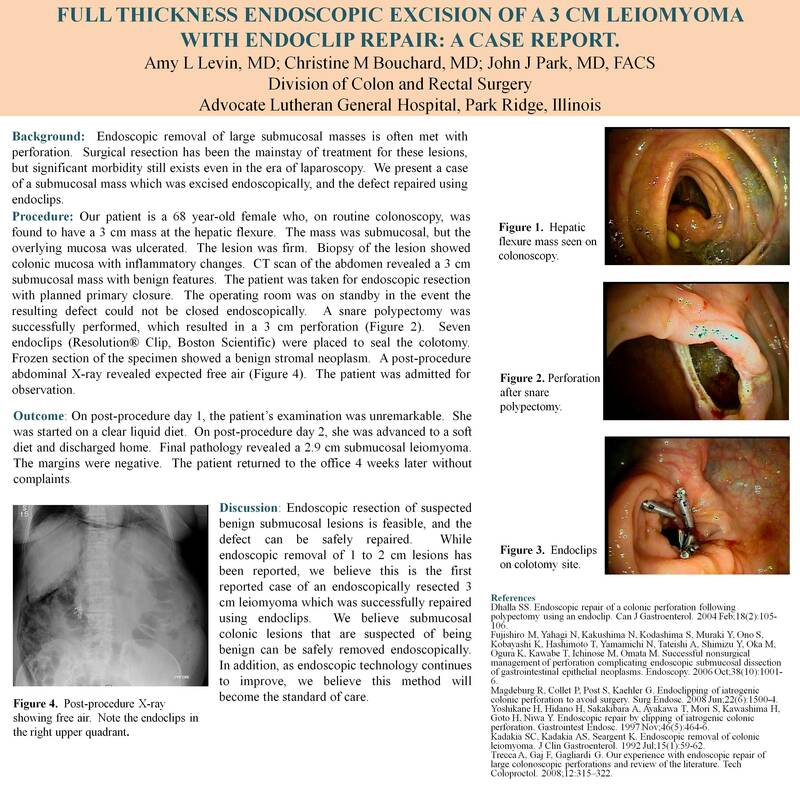 Full Thickness Endoscopic Excision of a 3 Cm Leiomyoma with Endoclip Repair: A Case Report. Background: Endoscopic removal of large submucosal masses is often met with perforation. Surgical resection has been the mainstay of treatment for these lesions, but significant morbidity still exists even in the era of laparoscopy. We present a case of a submucosal mass which was excised endoscopically, and the defect repaired using endoclips. Procedure: Our patient is a 68 year-old female who, on routine colonoscopy, was found to have a 3 cm mass at the hepatic flexure. The mass was submucosal, but the overlying mucosa was ulcerated. The lesion was firm. Biopsy of the lesion showed colonic mucosa with inflammatory changes. CT scan of the abdomen revealed a 3 cm submucosal mass with benign features. The patient was taken for endoscopic resection with planned primary closure. The operating room was on standby in the event the resulting defect could not be closed endoscopically. A snare polypectomy was successfully performed, which resulted in a 3 cm perforation (Figure 1). Seven endoclips (Resolution® Clip, Boston Scientific) were placed to seal the colotomy. Frozen section of the specimen showed a benign stromal neoplasm. A post-procedure abdominal X-ray revealed expected free air (Figure 2). The patient was admitted for observation. Outcome: On post-procedure day 1, the patient’s examination was unremarkable. She was started on a clear liquid diet. On post-procedure day 2, she was advanced to a soft diet and discharged home. Final pathology revealed a 2.9 cm submucosal leiomyoma. The margins were negative. The patient returned to the office 4 weeks later without complaints. Discussion: Endoscopic resection of suspected benign submucosal lesions is feasible, and the defect can be safely repaired. While endoscopic removal of 1 to 2 cm lesions has been reported, we believe this is the first reported case of an endoscopically resected 3 cm leiomyoma which was successfully repaired using endoclips. We believe submucosal colonic lesions that are suspected of being benign can be safely removed endoscopically. In addition, as endoscopic technology continues to improve, we believe this method will become the standard of care. Figure 1. Perforation after snare polypectomy. Figure 2. Post-procedure X-ray showing free air. Note the endoclips in the right upper quadrant.